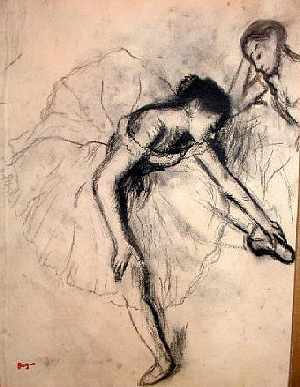 Rare Degas Charcoal drawing of a Dancer. History/Provenance: The work comes with Provenance(Private Collection/Belgium) but no COA(Certificate of Authentcity). "Hello, thank you for your mail. Sorry but my english is poor.I have no COA but I know the provenance of the drawing. My great-father liked +++ art and the artists and took many trips. He bought this beautifull drawing in Scotland, in a gallery (Gifford and Mair) at the beginning of the century (20th).This gallery doesn't exist any more. I received some drawings when my father died. I have no time and no money to make expertise, but it is an old and wonderful drawing, and I think it is an original. I hope to buy it to a private people and not to a gallery." This original colored graphite drawing signed Picasso, is one of a number of paintings and drawings that will be offered for auction on ebay. Not a lithograph or print of any kind. 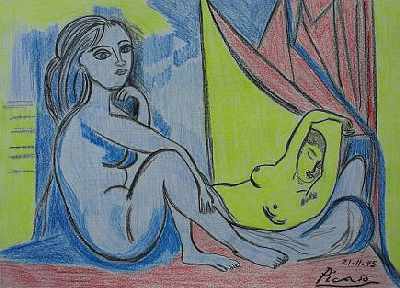 There is no reason to go on about this great artist.......... Pablo Picasso. The drawing measures 8.95 inches in height and 12.75 inches in width. The paper is slightly yellowed with age, however the drawing is in overall excellent condition, and has been kept unframed for many years. This work, as well as a number of other works of varied artists, has come to me via my parents and grandparents. Grandfather was Russian born and traveled extensively as a violinist, and concertmeister for ballets, etc. There were many stories of him traveling and working with famous artists and musicians. As a practical matter this drawing is offered... As is, with no paperwork, and will go to the highest bidder....do your own research before bidding, as all auction results are final. No reserve, bid with confidence. Mr. Goldberg otherwise known as goldielox2 (how come I don't feel a sense of "gildness" here?) is in full swing selling grandpa's false paintings. His grandfather, Joseph Goldberg, was born 1881 in Russia. He died in the U.S.A. in 1946. This original watercolor signed Marc Chagall, is one of a number of paintings and drawings that will be offered for auction on ebay. Not a lithograph or print of any kind. 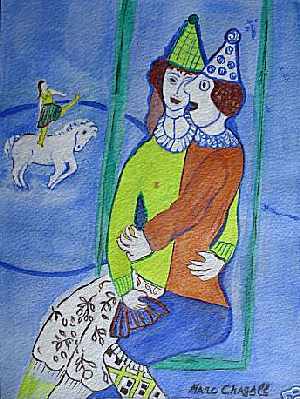 There is no reason to go on about this great artist.......... Marc Chagall. This watercolor painting measures 12.2 inches in height and 9 inches in width. It is in overall excellent condition for its age, and has been kept unframed for many years. This work, as well as a number of other works of varied artists, has come to me via my parents and grandparents. Grandfather was Russian born and traveled extensively as a violinist, and concertmeister for ballets, etc. There were many stories of him traveling and working with famous artists and musicians. As a practical matter this painting is offered... As is,with no paperwork, and will go to the highest bidder....do your own research before bidding, as all auction results are final. No reserve, bid with confidence. 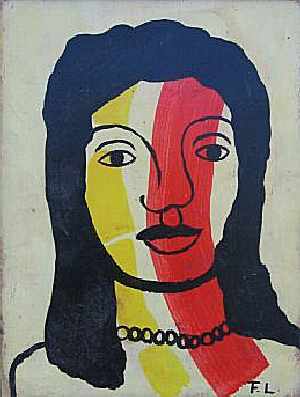 This auction is for an original oil on board, created circa 1920, by Fernand Leger. Measuring approximately 10" by 13" within a frame of 12.5" by 15.5", the work is in good condition with some surface grime and abrasion. The consignor found this painting at a used-goods sale in Central Florida and does not have provenance for the work; bearing that in mind, he estimates its value at $2,100. What a happy buyer! $2,720.00 for an original Léger! Signed lower right hand corner. Yes, Alexander Calder is a known artist. 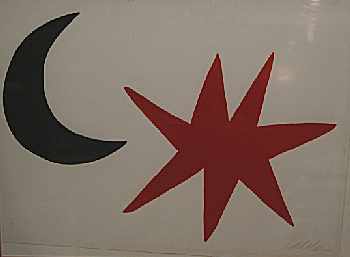 But this watercolour is NOT a genuine work by the known Calder.